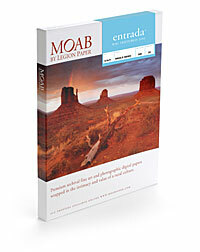 Entrada Rag is what put the Moab brand on the map. This award-winning 100% cotton fine art paper helps bring your vision to print through superb ink handling and sharpness. 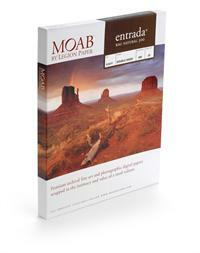 Entrada is an archival acid- and lignin-free paper with an expanded color gamut, natural contrast and high ink load. It is compatible with both dye and pigment inks ensuring that when used with archival inks, your prints will last for generations. The original Entrada has a smooth surface and is available in both a Bright and an OBA-free Natural version allowing you to match the color to your project's needs. NEW Entrada Rag Textured is the first new paper to be launched within the renowned Entrada family. 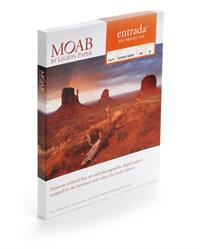 Its subtle texture and warm tone exhibits the same superb Entrada printing qualities of the classic Entrada smooth. The wide tonal range and high dMax remains unparalleled for a cotton matte paper. The defined, yet subtle, texture enhances the printed image without being distracting. Its natural warm surface matches perfectly to the existing Entrada Rag Natural paper, making this a nice alternative to the traditional smooth finish. Now shipping. Outer Diameter of 100ft rolls is 6.5" (16.5cm); 75ft = 5.87"; 40ft = 4.83"
Entrada Rag Textured 300 [Sheets & Rolls] NEW!